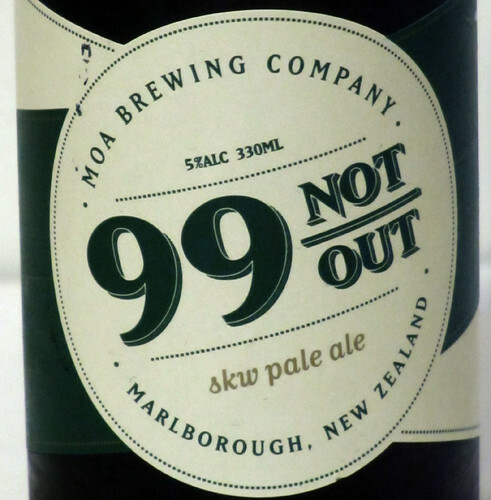 This has Shane Warne's signature on the label. I don't know why a bowler is involved with a label showing a batman's score - and a good one, too. One a bowler wouldn't like to see, normally, but Warnie's highest score was out on 99, but he was given out when caught off a no-ball*. Therefore, the label name. And the Cricket World Cup is on the telly! Pours a dark golden colour with a small amount of sediment. The head is small but quite thick and long lasting. A small amount of carbonation is visible in the glass. First sip: Mild, slightly sweet malts with a biscuity flavour. Slight citrus flavour which swamped by a mild but very long lasting hops bitterness and dryness. Mouth-feel is light and a little thin, and a bit foamy on the tongue. This one makes me go "Hmmmmm..." followed by "I dunno" then "Yeah. Okay." It is quite drinkable, and gets better as you drink more. I think it's let down by the thin mouth-feel. 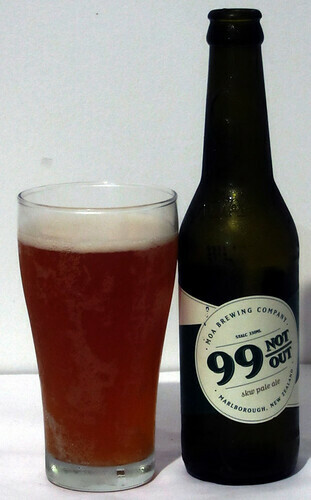 Even so, it's quite drinkable and would go well at a BBQ. I could happily settle in for a session with this brew. And of course, farmhouse cheddar. *no, this is not a string of random words. *snerk* I have long thought that, like the Navajo language, cricket is impossible to understand unless one grew up with it. You guys don't know what you're missing.